If you haven't ventured to the Westfield Century City Mall to explore Eataly L.A., now is a great time to give it a go. The marketplace is a 67,000 square feet of Italian goodness, featuring multiple restaurants, food counters, and an authentic Italian market. 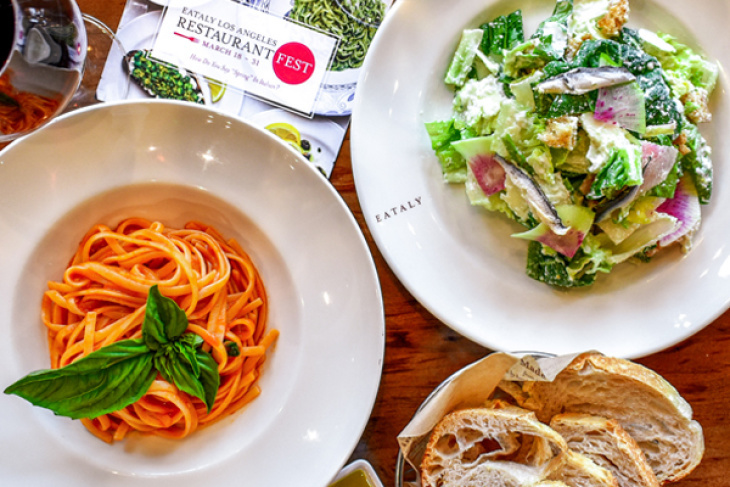 For the next two weeks (March 18 -31) Eataly is hosting their Eataly Restaurant Fest - making it the closest thing to a trip to Italy that most of us will get this Spring. What makes this event so special? Three restaurants, each featuring their own Italian lunch and dinner seasonal menus ($18 or $28) and specially priced Italian wine by the bottle ($25) that will only be available for these two weeks. Choose from an Antipasti and a Piatti from the 2-course prix-fixe menus at any of Eataly's full-service restaurants - Terra (located on the rooftop), Il Pesce Cucina, or La Pizza & La Pasta. If you would like to complete your meal with some vino, guests can choose from a curated menu of white and red spring varieties. While this seasonal menu will likely leave you satiated, if dessert is still on your mind there are a handful of options within the three floors of Eataly. From Cannoli E Bomboloni, the filled-to-order cannoli take-away counter, to Il Gelato, where the gelato is served in handmade cones, you'll have some sweet options to choose from. For more information on Eataly's Restaurant Fest and to take a look at the spring-inspired menus at each restaurant, visit here.